This day belongs to alex. "happy birthday mama! i love you"
81º in NYC! 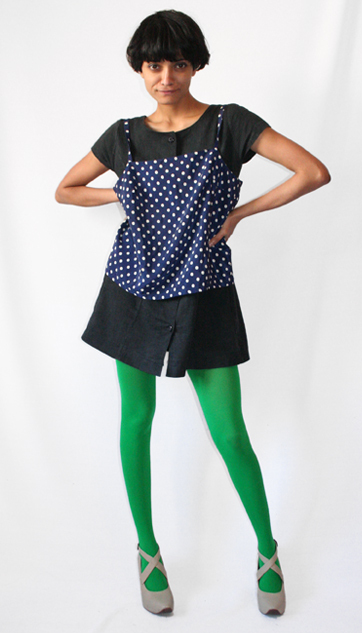 Thrifted polka dot tank, fluorescent tights from Sockdreams and pumps donated by Tara St. James. Payal tagged this Ready for flight! You look so light and fresh in these colours. You almost look like you could just fly! Love it all. Tank, tights, pumps. Could you please tell me if the shoes on auction are in american sizes? 17 hrs to showdown - I'll be up at 3 am! @Payal, yes shoe sizes are US. Good luck with your bids! wow. 81 degrees... its 81 here in boston too. i love the outfit. its perfect for the weather. holly tagged this 23 days to go! my favourite shoes! lucky you Payal, right size feet.... and almost 200 kids in school. Wow, 81! I just got back from skiing after a storm that dumped over four feet of snow. :) (It's supposed to be spring where I am.) Your legs are the color of new shoots, I like it! ahhh ..... the old polka dot top controversy amongst fans ..... some love it and some very much not. But I love the green legs. So adorable. I love seeing colour on you! Will you post somewhere how much you've raised through the accessory auction? Or a running total, to date? Dying to know how it's going! you can do no wrong. seriously love the bright tights that are making me green with envy...and those shoes. could we pause a moment for the shoes? and love the dots - so happy and spring-like!